I've used a traditional red and green colour-way for mine, you can change it up as you wish and make a non-Christmas theme to use all year round! 1. 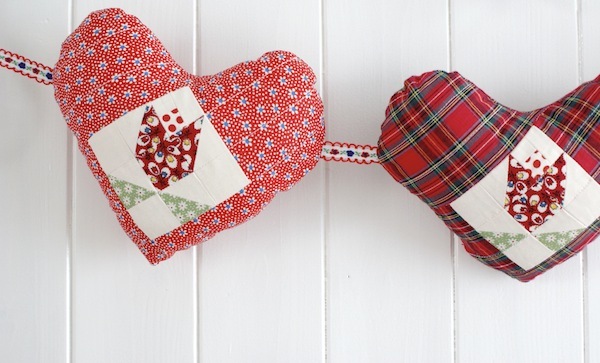 Print heart template, available to download for free here. 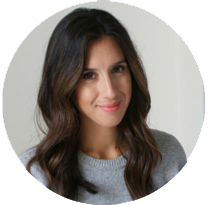 Ensure you print the document at 100%, and un-check the 'scale to fit page' option. 2. 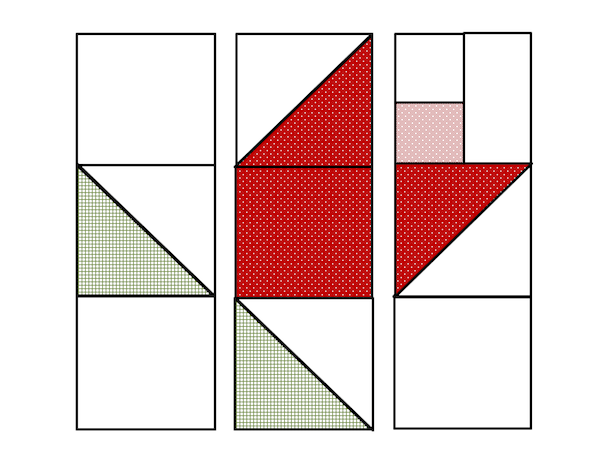 First off, cut all the 1 7/8" squares in half to form half square triangles. 3. Sew 1" background square with 1" square tulip centre. 4. Sew with rectangle to the right. 5. 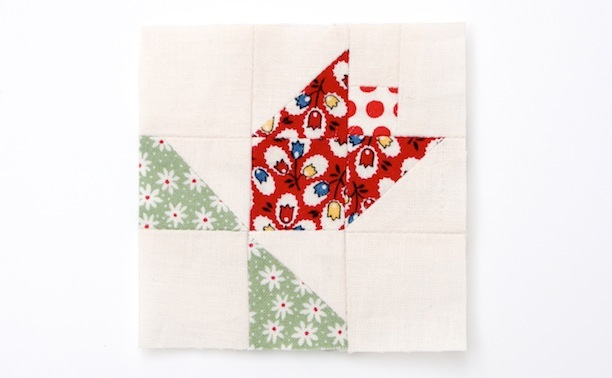 With the half square triangles you have just cut, sew a background triangle to a tulip triangle. 6. Finish assembling the block as shown above. 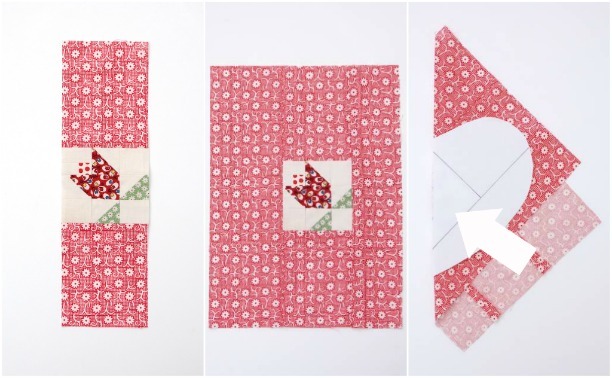 Once you have 3 strips, press and sew the strips together to form the completed flower block. 8. Sew 2.5" x 11.5" rectangle to the right and 3.5" x 11.5"rectangle to the left. 9. Fold along the centre of the block (creasing at the angle with the tulip centre). 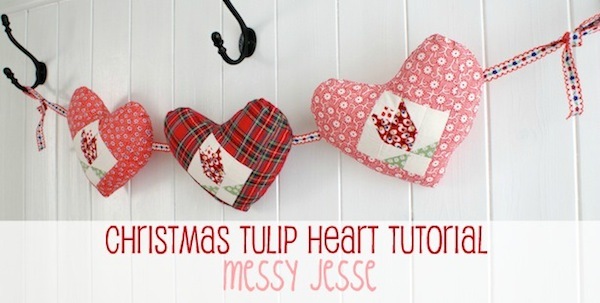 Use the heart template to guide the tulip block in the centre, as shown in the arrow above. 10. Pin in place and cut around the heart shape. 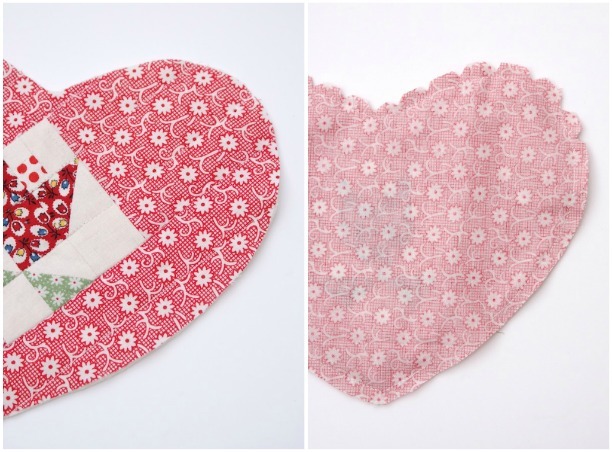 Using the completed heart shape you now have, use this as a guide to cut out a further shape from backing fabric and batting. 8. 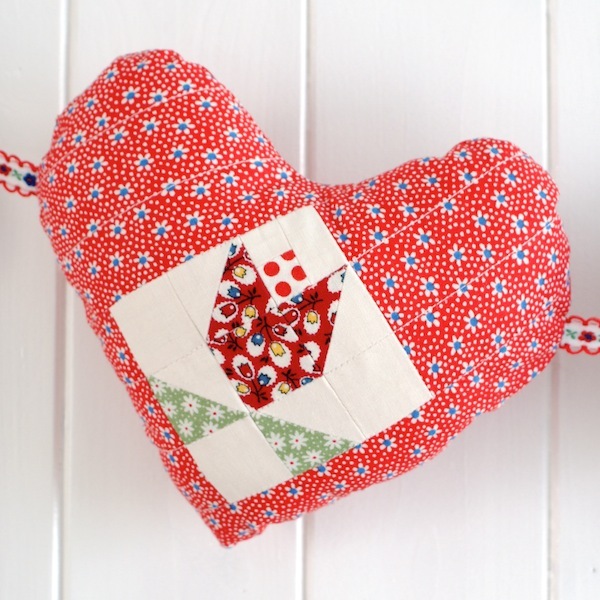 With the heart shape on top and the batting underneath, quilt 1" lines running down the seams of the tulip. 9. 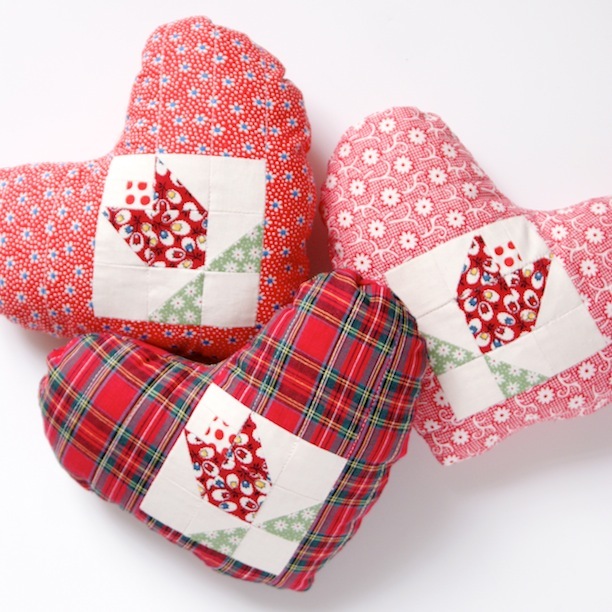 Lay your backing heart with the quilted heart front on top (right sides together). Stitch around the edge using a 1/4" seam allowance, making sure you catch all the layers together and leave a small gap for turning. Snip into the curved edges of the heart to reduce the seam bulk. 10. Turn inside out and stuff with polyester toy filling, being sure to pack them firmly in order to hold their shape. Slip stitch the turning hole closed in coordinating thread. After I made the hearts I decided they would look cute as a garland, and also because I've been saving up a use for the cute folky ribbon I've used. I cut a length long enough for both end pieces to tie with a bow and then cut smaller pieces to join them together. I then just used a seam ripper to make a small holes where I needed to join them and a few stitches later it was complete! These are very sweet Jess! 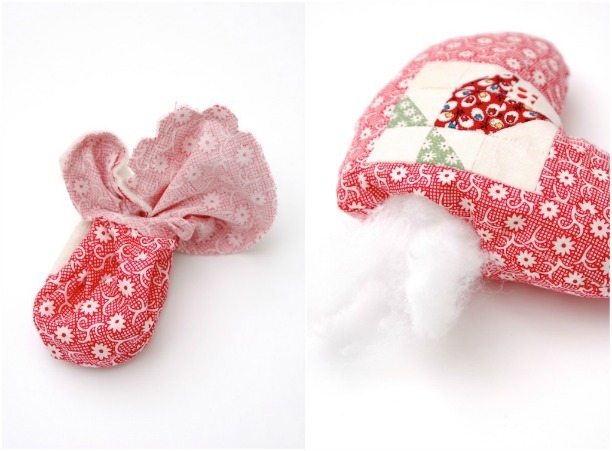 I am definitely making these- thanks for sharing the tutorial! Very cute! Thank you for the great tutorial. Super cute.Thanks for the tutorial!! These are so gorgeous. I love the idea of the tulips. It makes it a garland that I could leave up all year if I wanted. Totally fab. Thanks for sharing. Thanks for the tutorial Jessie! These are the cutest! These are so precious! My readers at FaveQuilts would love them. They look gorgeous....think I would leave mine up all year.